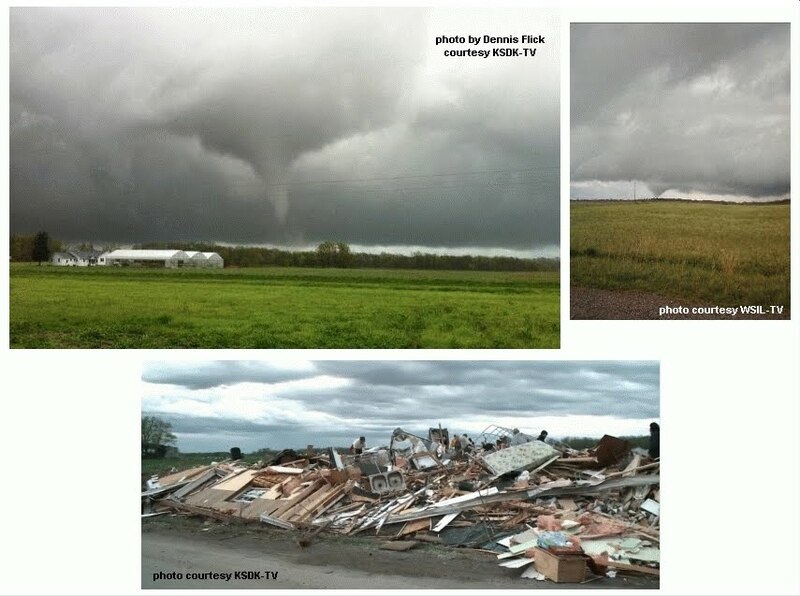 Sadly, one of yesterday's cold-core tornadoes at midday over southern Illinois killed a woman in a double-wide mobile home near the small town of Opdyke (see photos above). It's rare that someone dies in a tornado related to a nearby cold-core mid-level low, as such tornadoes are usually weak and short-lived. This tornado did not appear particularly strong or long-lived, but hit in the wrong place at the wrong time, and will probably be rated either EF1 or low-end EF2. (As I write this, there's no information yet regarding tornado intensity from the NWS). The same system produced many cold air funnels over Oklahoma on Wednesday March 21, and again over Kansas on March 22 (not shown). The main reason there were no actual tornadoes on those days had to do with the Pacific cool front surging far eastward into the Mississippi Valley, taking the potential surface boundary focus and true surface warm sector well east of the mid-level low spinning over the OK/KS area. However, on Friday March 23, the mid-level low (see the NAM model 500 mb panel and satellite image above) was moving east again, moving closer to the surface Pacific front that had stalled near the Mississippi River with a surge/spoke of energy aloft. As a result, a new surface low was forming over the mid-Mississippi Valley (see surface map above), providing a surface boundary focus for vorticity and convergence where thunderstorms were building at midday over southern Illinois just ahead of the closed low and cold pool aloft. One cell generated intermittent tornadoes from near Cape Girardeau MO to north of Carbondale IL. Another cell developed rapidly north of Marion IL and produced the killer tornado near Opdyke shortly before 1:30 pm CDT (1830 UTC). An estimated sounding from the new Rapid Refresh model (set to replace the current RUC model in April 2012) showed sizable CAPE at Marion IL over an hour before the Opdyke tornado, with nearly all instability located below 26000 ft (see the sounding diagram above). An article here by Stan Finger in the Wichita Eagle yesterday about the recent Harveyville KS tornado (see my previous blog post last Thursday 3/1/12) claiming that there was "no warning" was not totally factual. There was indeed a severe thunderstorm warning issued that mentioned a tornado watch was in effect, as well as the possibility of tornadoes that could form quickly (see above). In my opinion, the way the article was edited (after talking by phone, I found out that the "no warning" headline was not Mr. Finger's responsibility) put the focus on the wrong issues, and was NOT helpful in improving public weather safety response and perceptions. 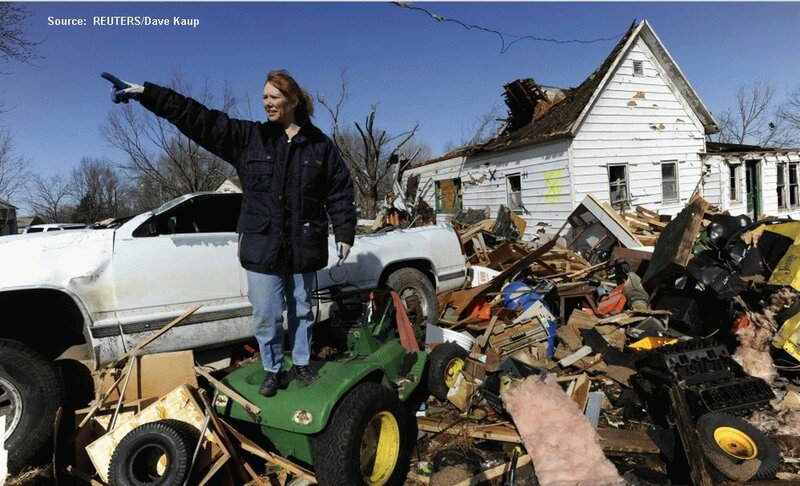 To be clear, the Harveyville tornado was light years away from the Joplin tornado in its brevity and weaker intensity, and it is ridiculous to focus on that isolated event compared to all the other tornadoes that occurred on Feb 29th and March 2nd when the National Weather Service did an exemplary job regarding watches, warnings, and public awareness. The article also came off, courtesy of quotes by Mike Smith, as a free advertisement for Accuweather's "superiorty" in detection and warning. In serving utility clients like Westar Energy, this corporate for-profit entity has none of the public responsibility and pressure that the National Weather Service has in an era where the general public wants to be warned about everything that affects them directly (an impossibility, even with our technology), but also thinks there are too many false alarms. 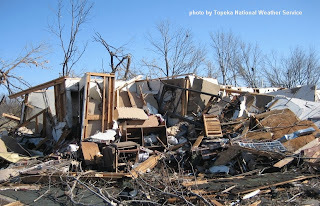 Your article yesterday about the Harveyville KS tornado was disappointing, and really missed some facts. First, there _was_ indeed a warning in effect for Harveyville when the tornado hit... a severe thunderstorm warning that specifically mentioned Harveyville and the possibility of strong winds (see attached). It also mentioned that a tornado watch was in effect and that tornadoes can develop quickly from severe thundertorms. So, your headline "Harveyville tornado struck without warning" is misleading and incorrect. The brief and narrow Harveyville tornado lasted only 4 minutes and happened to go right down through town. Had it occurred a couple miles north or south of where it did, we might not have even heard about it. The small tight rotational signal that appeared on radar was truly visible for only one scan as it was upon Harveyville, with no time for an advance specific tornado warning. The quotes you gave from Mike Smith were not at all in proper context, and were like comparing walnuts with oranges when talking about what Accuweather does relative to the National Weather Service. "Warnings" given by Accuweather are mainly for utility and transportation clients, who don't generally object to overwarning issues... they just want to be prepared and alert for power line breaks and transportation interruptions in specific locations, whether from strong straight-line winds or tornadoes. So, Accuweather can issue tornado warnings continuously and indiscriminately along a long-track supercell's 3-4 hour path without public complaints and repercussions, regardless of whether verified damage is from winds or tornadoes. It's no big deal that Accuweather supposedly issued a so-called "tornado warning" for Westar and the Kansas Turnpike Authority some "4 minutes" before Harveyville... they were doing similar warnings along the entire supercell's path when _no_ tornadoes had been occuring for over 2 hours, even with what Mike Smith referred to as "persistent tornadic signatures" (actually a parent mesocyclone with _potential_ to produce tornadoes). Many storms show persistent strong rotation without producing tornadoes. The larger issue here is the public perception of "overwarning" that came out of the Joplin tornado NWS assessment. Many people at Joplin (including some I talked to) complained that sirens are run too often, fostering a public perception that they are hard to take seriously. The NWS is attempting to address that perception this spring, and that puts them in a difficult position on events like Harveyville. Mike Smith and Accuweather have none of that pressure... they can warn every location in a storm's path for their corporate clients whether reports verify or not and claim they did a better job than NWS, even when they have no responsibility for actual public warnings and overwarning perceptions. The reality is, even with radars that have faster scans and better technology, the National Weather Service (and Accuweather) cannot in real-time discriminate between tornadoes and other severe phenomena in many situations. Some tornadoes are just too brief. The public needs to understand this and not expect someone to come "knocking on their door" to personally warn them for every potentially severe event. There _was_ a severe thunderstorm warning for Harveyville at the time of the tornado, and also a tornado watch in effect. People should be prepared and responsible for their own safety by taking all warnings and watches seriously. They can then monitor cell phone alerts, radar, television, and/or weather radios for additional information to assess their risk rather than expecting sirens to warn them specifically for _everything_. If a strong supercell on radar with a severe thunderstorm warning is approaching and your town is directly in its path, you should be prepared to take cover _fast_, regardless of whether or not a tornado warning is in effect or the sirens are blaring. Besides missing some important facts, the general tone of the article you wrote yesterday did not help in this regard, and comes off as promoting private for-profit corporatations like Accuweather that have none of the public resposibilities and pressures of the National Weather Service. The National Weather Service did a superior job with watches, warnings, and advance public awareness on the March 2nd tornado outbreak 3 days ago, and many lives were saved. You didn't mention that in your article, and instead focused on NWS performance in a single isolated weather event. - The reality that no weather organization or corporation can warn or alert the public on every severe event, particularly brief or isolated ones! - The public perception of overwarning vs. the public desire and expectation to be properly warned on everything that affects them directly. How does one even approach a solution to this? These are huge social issues! - What can we do about the public ignoring severe thunderstorm warnings? - As discussed above, the National Weather Service has some category of watch or warning issued to alert the public on the vast majority of weather events. This was certainly true with the Harveyville tornado. If people want to stay safe, they need to take some degree of responsibility for themselves by monitoring available weather information and taking appropriate action instead of relying completely on sirens and/or specific warning "categories". Rather than write attention-grabbing headlines ("there was no warning"), let's get the facts straight and not mislead the public about difficult-to-detect events. Instead, let's educate and encourage the public to monitor the available weather information we have (which is of good quality) and take some responsibility for themselves. The tornado outbreak this past Tuesday evening into early Wednesday morning took several lives in Kansas, Missouri, and Illinois, and was an early reminder that spring is nearly here in the central U.S. Hardest hit was Harrisburg IL with an EF4 tornado killing 6 people around 5 am Wednesday morning. The first killer tornado (EF2, see damage photo above) hit around 9:00 pm the evening before, southwest of Topeka KS at Harveyville, claiming the life of one man who died later on Wednesday night. This was a very difficult warning situation. 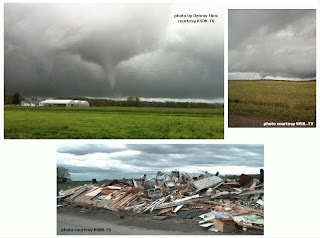 The tornado only lasted about 4 minutes, but happened to go right down through the small town. Had the path been displaced a few miles north or south, we wouldn't have heard much about it. The parent supercell (see arrows on radar composite above) developed near Pratt KS more than 3 hours earlier, producing a brief tornado southwest of Hutchinson, but hadn't produced any other reported tornadoes for over 2 hours since that time. The rotational signature on radar at the time the tornado hit Harveyville was brief and small (see Topeka NWS radar images here). The Harveyville area had been under a severe thundertorm warning for about 30 minutes prior to the tornado. A look at the meteorological setting shows that, even though CAPE was relatively "small" over east central and northeast KS (< 500-800 J/kg, see RUC soundings above), strong warm advection was occurring from the southwest. A comparison of NAM model temperature & moisture profiles from 6 to 9 pm near Emporia (see 4th graphic above) showed that warming and moistening was occurring in the lowest 1.5 km above ground, with cooling ongoing above that. This reduced a sharp temperature inversion that was present earlier, and changed the thermodynamic environment from "quasi-elevated" (most instability coming from air parcels originating well above ground) to one that was becoming more surface-based. While never strongly surface-based as seen by the Emporia RUC soundings above (probably one reason the tornado was short-lived), enough low-level stability was being removed by the low-level warm advection in combination with very large low-level wind shear (storm-relative helicity over 600 m2/s2!) to sustain marginally surface-based updrafts that could briefly support a strong tornado. The fact that the parent supercell had been established for so long (3 hours) in flow of more than 80 kts aloft also likely helped the storm produce the tornado in a marginally surface-based setting. This is a reminder that long-lived supercells within a zone of strong warm advection and low-level shear should be watched carefully regarding tornado potential, even if the initial environment ahead of the warm advection looks rather "elevated" in nature. The last graphic above shows the evolution of the surface pattern and the tornado environment (as suggested by the SPC significant tornado parameter) during the night. Tornadoes occurred in southern Missouri near Buffalo (1 death) and at Branson, and also in southern Illinois with the deadly EF4 tornado at Harrisburg before dawn. Farther north from Kansas City eastward, storms finally outran the warm advection zone and moved into a more stable environment, eventually losing their severity. Tonight and tomorrow (March 2nd) will likely see a repeat performance of tornadoes over southern MO and northern AR into the Ohio Valley with yet another weather system. People in those areas should be on the alert!